This site has been CONFIRMED for 2019. Serving Time: 9:00 a.m to 4:00 p.m.
Why are we serving here? One of the ways ForColumbia strives to love and serve our neighbors is by serving those non-profit organizations who are actively working every day in the lives of people in Columbia. We are very excited that Welcome Home was one of our 2018 serving sites. This non-profit organization works entirely with homeless military veterans, providing services, resources and transitional housing for these men and women who have served all of us. Veterans who reside at Welcome Home often struggle with physical and/or mental disabilities and need help to stabilize their lives. When we give our time for the benefit of others, especially when they are going through a dark season in life, we send the message that they are valuable. ForColumbia volunteers will be working both inside and outside at Welcome Home on a variety of projects. Don’t forget to wear your T-shirt! Volunteers should bring work gloves, and be prepared to work outside. If sunny, we encourage you to consider bringing sunscreen and/or a hat in case you are assigned to the outdoor work. We encourage all volunteers to wear close-toed shoes. 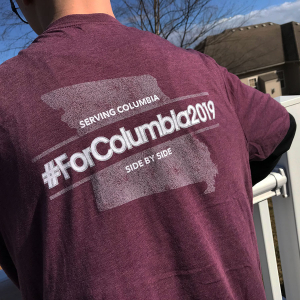 Be sure to wear your #ForColumbia2019 T-shirt! Can I serve here with my children? Yes, we encourage families to bring older children who can assist in the listed projects.